This product can be downloaded from the Google Play Store. If you are not able to access the Google Play, just type this URL into the Web browser on your Android device to manually install the program: LPB.cc/android. You must ok the installation of third party apps on your device. 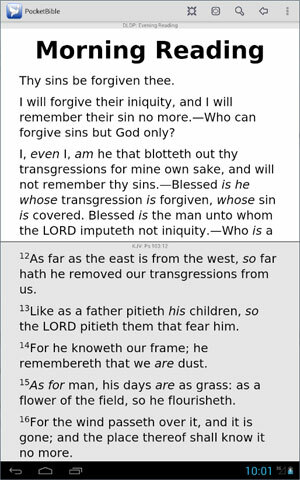 Open up to five windows to view Bibles or books side-by-side on your tablet (up to 2 windows on a phone). Change background and text color for ease of reading. PocketBible comes with over 40 free titles. Choose from a growing collection of Bible and books to expand your library at any time. Adjust PocketBible settings to your specification. Open two windows to view books side-by-side (up to 5 windows on a tablet). 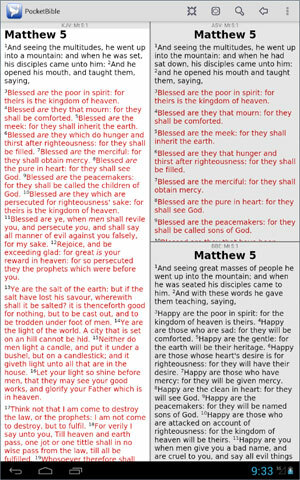 Read the words of Christ in red (where available, see specific Bible page for details). Optionally change font, font size and background color for ease of reading. Tap on cross-references to view related verses instantly. 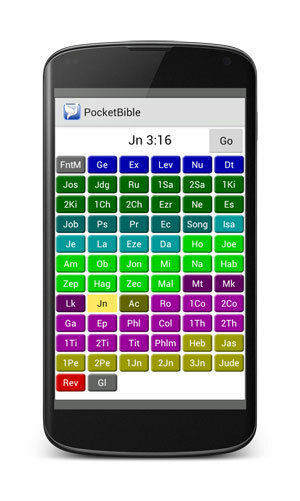 PocketBible couldn't be simpler to use! Go anywhere in the Bible by selecting book, chapter, and verse. 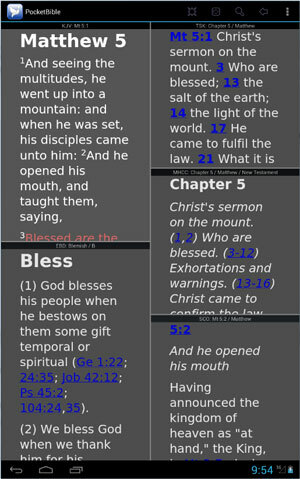 Split the screen to view Bibles and commentaries side-by-side. Select "Today" from the menu to read today's devotional or Bible reading plan. When you install PocketBible, you'll have instant access to the King James Version of the Bible. Upon registration, you'll get access to over 40 other free Bibles, commentaries, dictionaries, devotionals, and more. And while most other Bible apps stop with free, 150-year-old, "classic" reference titles, there are hundreds of additional Bibles and contemporary reference books available for PocketBible. We've all experienced the disappointment of "online" Bible apps that become unusable when cellular signal strength is low or WiFi is not available. With PocketBible, your Bibles and reference books reside on your device, so no Internet connection is required once they've been downloaded. Are you already a PocketBible user on another platform? 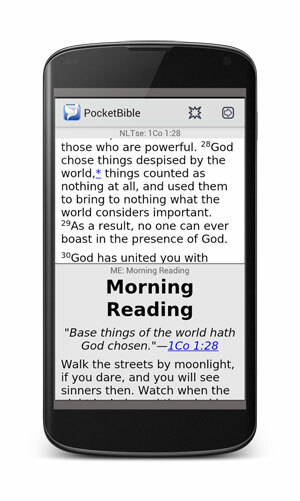 PocketBible for Android can access any of your previously purchased books and Bibles. And if you have notes, highlights, or bookmarks you've created on another platform, they'll sync seamlessly to PocketBible on your Android device! PocketBible gives you lightning fast access to your favorite Bibles, reference book, devotionals and more! The free version has the following features. Additional advanced features are available for a nominal subscription price. Read and study the Bible anywhere. Unlike other Bible apps for Android, no Internet connection is required once you've downloaded your Bibles and books onto your device. Continuous scrolling means you'll never fall behind your pastor or Bible study leader.! Compare PocketBible to your current Android Bible app – PocketBible really is lightning fast! 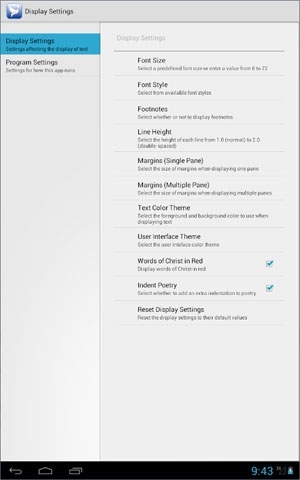 Quickly go to any verse using the colorful book/chapter/verse chooser. Search your Bibles and books by word or phrase. Easily switch between any number of open Bibles and books. Record what you learn by taking notes, highlighting passages, and setting bookmarks. Bible references in your notes are automatically linked to the Bible. Track your progress through devotionals and Bible reading plans. Synchronize your notes, highlights, bookmarks and daily reading progress with the Laridian Cloud and share between your other devices using PocketBible. Adjust font, font size and background color for your reading pleasure. Register PocketBible for free access to 40+ Bibles, reference books, devotionals and reading plans. 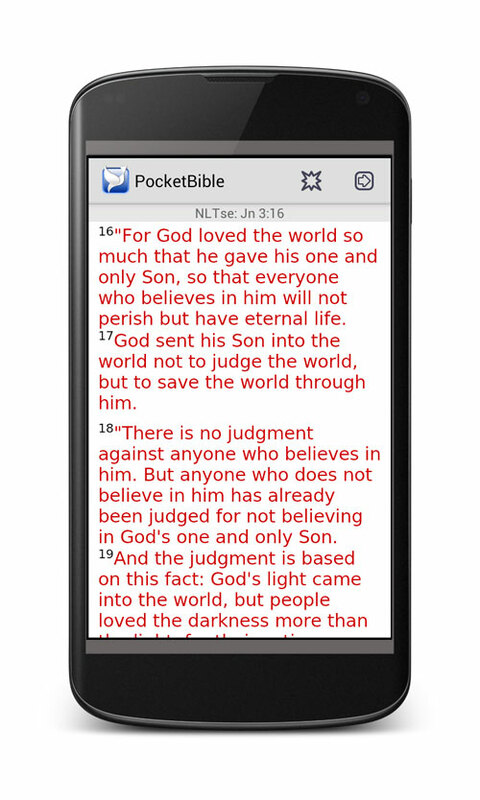 This free version of PocketBible provides all the features you need to read and study the Bible on the go. But for serious study on your Android phone or tablet, consider a subscription to the Advanced Feature Set. Features include the ability to search your entire library in one step; our unique Autostudy feature to bring together everything in your library to support the study of a passage or word; the Journal lets you enter notes that are not attached to any particular Bible verse; and synthesized audio to read the Bible to you. 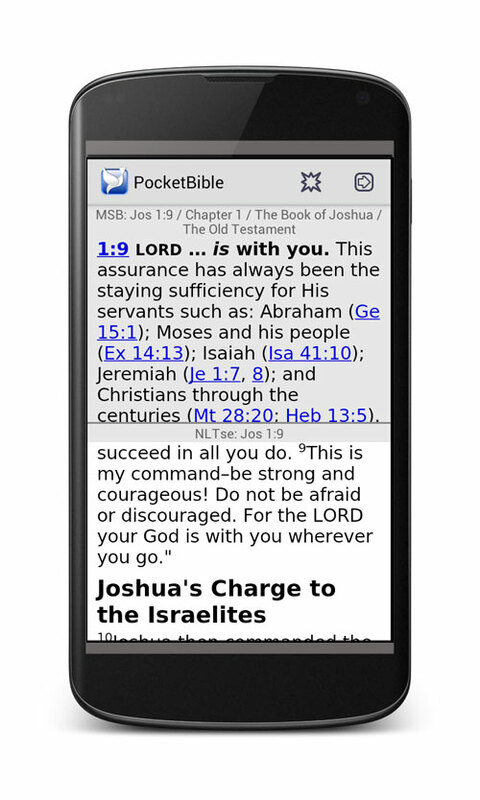 PocketBible is compatible with Android OS 2.2 or later. An Internet connection is required to download the program from the link above and the additional Bibles and reference books from our server after installation and registration.